Windows 10 is a fresh new update for PC users as they can feel at home again while using a PC. Microsoft tried to combine two platform together with Windows 8 but it went horribly wrong for them as users across the world criticized them for the OS. If you share your computer with others, there is always the chance that someone will either accidentally delete your stuff or otherwise mess with it. You can prevent that by password protecting it. If you would like to password protect a folder in Windows 10, here’s how you do it. What is Folder Protect Windows 10/8/7? Worried about your personal files getting accidentally deleted by your kids? Want your colleagues to view but not modify your business files? Folder Protect can do just that! It lets you password protect folders, drives, and extensions using 16 different types of custom password protection. Choose between view, access, modify and delete and achieve the security you want. 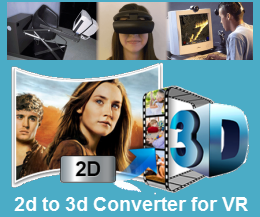 It works on 32-bit and 64-bit Windows 10, 8, 7, Vista, XP. – Lock Desktop applications like Outlook Mail etc. Folder Protect for Windows 10/8/7 activates the protection after a certain period of time. If you have left your PC idle for a certain period of time, the protection is automatically activated. You can set the time period that is suitable to you and have a complete peace of mind knowing Folder Protect has got your back. One way or the other, the prying eyes make numerous attempts to access your private files. One way of doing that is through the safe mode. Again, Windows 10/8/7 Folder Protect stays one step ahead by letting you use this feature. Even if someone boots your PC, turning ON this feature will restrict them there and then. You can protect your executable in two ways. The files that you protect using Folder Protect for Windows 10/8/7 can be further protected with the feature of ‘Deny Access’ and ‘Prompt Password’. The deny access feature will make the executable inaccessible and can only be accessed until this feature is deactivated. In the same way, you can use the ‘prompt password feature’ to access the particular executable. Folder Protect Windows 10/8/7 is a new concept in data security that is designed to provide you with maximum data protection protocols to safeguard and protect all your important and personal files, folders, and drives. It lets you password protect folders and files in a unique way that enables you to make your folders and files accessible yet completely secure from being deleted or modified. This is useful as most times, you may need to give restricted access to your data to others. In such a scenario, you can keep your data from being modified, copied, moved or deleted. Protecting folders and files in this way has solved the associated risks of data sharing by empowering you to customize the different types of security methods for your data. Folder Protect for Windows 10/8/7 allows you to password protect files, folders, drives, installed programs and popular extensions with four different levels of security to make your files and folders inaccessible, hidden, delete proof or write protected. Download and install it on your computer. Run the program and it will ask you to set and confirm a password. IMPORTANT: Make sure to set a strong password which is easy to remember but hard to guess. Once you have set and confirmed the password, click on ‘OK’ to log in to the application and then click the ‘Add’ button to add files, folders, drives, program or extensions. Both of these steps are self-explanatory. The option titled ‘Choose the Protection Method’ asks you to specify the folders and files to protect. This step additionally features four distinct methods of protection that you can choose according to your needs. You may select from No Access, No Visible, No Delete or No Write to make your data completely inaccessible, hidden, delete proof or write proof respectively. The second option titled ‘Add Items You Wish to Protect’ allows you to protect files, folders, drives, masks or programs individually. 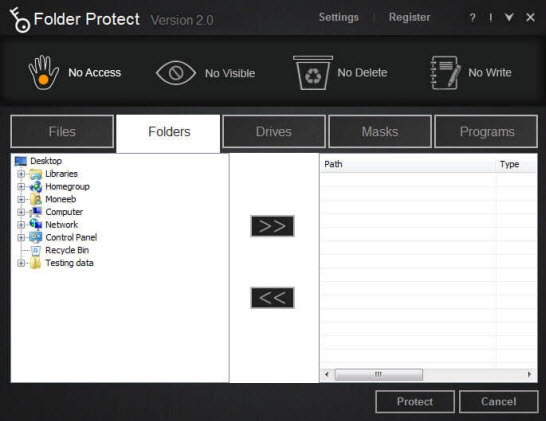 Select the protection type that you want to apply on your folders and files. Click the ‘Files’ tab to protect files, and ‘Folders’ tab to protect complete folders. When you click the respective tabs, Folder Protect shows you a folder tree containing all the files and folders so that you can choose which file or folder you want to protect. Select the files and folders and add them to your locking list by using the ‘Add’ button. Drag and drop is also supported. When you’re done with the selection, click the ‘Protect’ button. Once you click the ‘Protect’ button, you’ll be able to see the list of your protected items, from where you can easily manage your protected items. With Folder Protect for Windows 10/8/7, you can password protect folders and files from being seen, read, or modified. With support for all variants of Windows OS including Windows 10, Windows 8.1/8, Windows 7, Vista, XP, Server 2008, and Server 2003, the protection for your confidential files is comprehensive.